I'm going to approach this whole Marcy's Diner ridiculousness from another angle. Sure, there's the whole childism aspect, but those in Zen Parenting-esque circles have done this to death. Besides that, we're preaching to the choir. None of her throngs of supporters give a gnat's eyelash about kids, as demonstrated by their myriad brilliant comments and I'm too tired of asinine people to worry about trying to educate them. So, let's chat about customer service instead. Among other things, I have a strong background in customer service and public relations. I have worked in those areas and been educated in them for years. I can speak with 100% confidence when I say that the owner of this family eatery did everything WRONG when it comes to customer service and public relations. Everything. E V E R Y T H I N G.
Good customer service is scarce enough these days. That as many people are supporting her as is the case, supporting that piss-poor customer service blows me away. And yet... I mean, folks, don't wonder why you get such awful customer service yourself when you support it for others. Don't once complain about a bad experience at a store, on the phone, or in a restaurant again, because you're all out there supporting that same crappy service for other people. You know what, don't take my word for it. Let's look at some (more) pro words of wisdom. 2) Know your products. In this case, her product is food. If she can't handle a short stack of pancakes, it's pretty clear she doesn't know anything about her product or business. 3) Know your customers. If you'd like an adult only establishment, perhaps go into a more fine dining business. If you're a down-and-dirty, cash only, family diner, you're going to get kids. If you want to know about kids, you might wish to take a couple classes on child development. 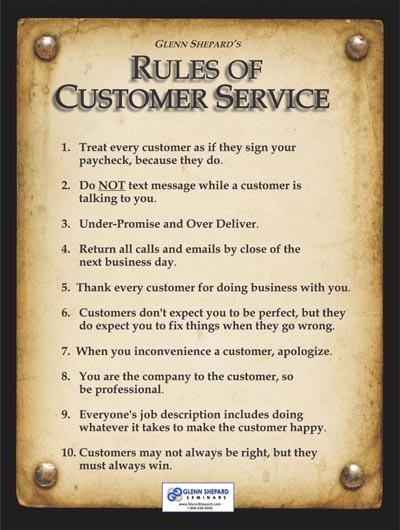 Then take a class or twelve on customer service itself, because customers like being treated nicely. Weird, huh? 4) Treat people with courtesy. She doesn't even think she's done this. I mean, do I really need to break this one down for anyone? 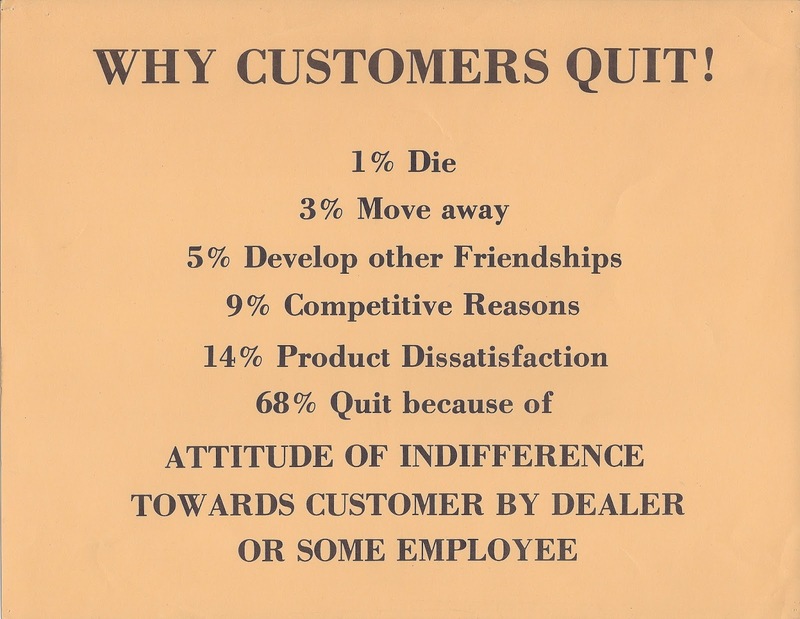 6) Don't leave the customers in limbo. Again, if you can't handle a short stack, maybe it's time to hire some help or, if that's no possible, at least communicate with the customer so they know what kind of wait they're in for. 7) Always provide what you promise. Pancakes. Pancakes in a timely manner. If someone asked for this at Fry's Electronics, that would be silly, of course, but I don't think it's out of bounds to expect a few of them on a Saturday morning at your local diner. 8) Assume customers tell the truth. I'm directing this to loyal Marcy's supporters. There's not a big reason for the parents to lie about this. There would be a reason for the owner to lie, but, as outlined above and below, her customer service skills are so lacking that she doesn't even care that people know how horrid she is. And, sadly, you all back her up. Again, don't be surprised when you cross her. Nobody's going to feel sorry for you then. 9) Focus on customers, not sales. People are loyal to you. Their money follows those loyal people. The funny thing about customer service is that good service will spread via word of mouth to just a couple people, BUT poor service will spread like wildfire. It may not seem fair, but it's reality, so you better be on point with those people who have no problem telling their friends when you're not. 10) Make it easy to buy. The best servers will always offer to put the kids' orders in first and tell the cooks to rush it. Why? Kids are kids. That means that they're sometimes impatient, irrational, and just plain pissy, especially when they're hungry. Want to circumvent a problem with the aforementioned? Get those orders out to them stat. Make it easy for the kids, the parents, and, in turn, the other customers and yourself. You may weather this storm, Marcy's. It is guaranteed, though, that if you continue to bring the rain upon yourself, you won't be in business for the long-term. 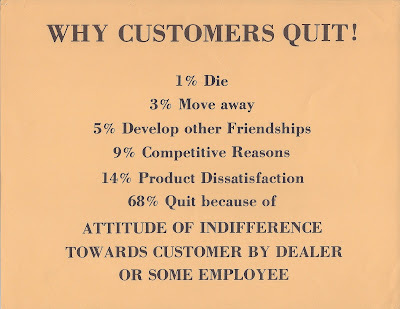 Customers quit. Word of mouth spreads. People matter. All people. Psst...kids are people, too. I think it's really easy for you to sit safely on the sidelines and pass judgement on the owner of this diner. What you fail to address are the terrible parenting skills of the entitled brats raising the little girl who wailed endlessly for over 40 minutes. When my kids acted like that, we packed up and left the establishment immediately and they went home hungry. It only happened twice. As a result, they learned to act appropriately in a restaurant. It is very simply RUDE to let your child negatively impact an entire restaurant / boutique / airplane, etc. Did the owner overreact? Probably. She had tried unsuccessfully to get the family to leave (their bad - not hers). Have you ever been subjected to someone else's child screaming for an extended period of time while the parents do nothing about it? I have and it's like fingers on a chalkboard - amplified through a Marshall. Your pious blather about "customer service" means nothing without addressing the hideous behavior of the "parents" in this scenario. Sure we need good customer service, but that does NOT give customers license to allow their children to abuse everyone else in the building. Period. Close, but no cigar. That's not how good customer service works. It is not dependent on the customer. Good customer service is good customer service regardless of the customer, not because of them. Yes, I've been "subjected" to this and more in my time in customer service. Nobody said it was easy to deliver good service, but it is necessary. Not feeding a child= child abuse. "they went home hungry". So you taught your children that when they don't act perfectly you will withhold one of their most basic rights as a human. Food. They didn't learn to act appropriately because that's "what you do" or "how you act". They learned to act appropriately because if they don't they have a fear of NOT EATING. I don't think that's what I want my children to fear... EVER in life. I had that fear as a child. My step mother withheld food as punishment. I learned to steal food and hide it under my bed in the middle of the night. I learned to steal food and slam it down as quick as I could which often lead to vomiting. I binge ate five pounds of sausage one night and nearly 1/4 of a cherry tree another day at my grandparents house. I still have issues with food and keep entirely too much around to the point that it VERY OFTEN expires before my family has a chance to eat it. We actually quit couponing because I bought too much food. But yea... hey, keep punishing your kids by taking them away hungry and denying them food when they are hungry. Nothing bad could come from that. Nothing at all. I'm sorry that happened to you, Anon. Did you watch the crazy owners interview? Really? Did you read her foul reply to the parents? Did you listen to the moms phone interview. The stories were on the opposite end of the spectrum. Was it screaming for 40 minutes or crying for 5? I don't know but witnesses there said it was not 40 minutes. Anyway how could there be 75 other customers in a diner that can't even easily accommodate an order of 3 pancakes in a timely manner? Besides, how come the mother claims noone asked them to quiet the baby nicely before yet this lady claims she did. I think maybe there is a truth somewhere between these 2 lies.. Still. No matter what the parents should have done, this lady could have handled it differently. The baby was 21 months old! Not a 4 year old causing a tantrum. No, customers aren't responsible for the actions of behavior of the owner, whose business it is to provide good service at all times, Christina. If it were easy to do, everyone would. Amy you got this backwards by a long shot!!! and get them some help? Laugh all you want, but I never once lost a customer to poor service. In fact, I got awards and accolades for good service, instead. Someone else's behavior cannot be allowed to dictate how you comport yourself. Good service is good service BECAUSE you can and do give it in the face of adversity. I teach parenting classes. From what I know about the brain crying for 40 minutes isn't good. Crying for 5 minutes is still really hard. Why didn't the restaurant offer this poor child something else to keep her going until her pancakes arrived? I also used to cook and what kind of a cook can't get an order of pancakes out to a crying child in under 5 minutes? If a proprietor cannot be kind to a child - I probably don't want the negative energy in their food. Bottom line - be kind. Being the other doesn't help anyone...and it doesn't win you customers. I am baffled at the naivete of posters here. This article was the most insightful and accurate. I see this as a study in sheep. Folks tend to have the wool over their eyes about liars and defamers. If a child is actually crying and screaming for 40 minutes, shed also be sweating, hyperventilating and probably fall asleep shortly after. I have studied this phenom for many years. I also know a lot about borderline personality disorder, which this owner seems to suffer. Its clear the parents were not extraordinarily out of bounds. Its a child, a very young child...we are dealing with hunger, anxious parents and poor weather conditions. Don't be such idiots, folks. Good article. It is a pity that there is no necessary and specific information. I have found here is similar https://www.jitbit.com/news/customer-service-skills/, there are tips for bigger and better quality. I advise you to compare these sources, you will understand me. Good luck.